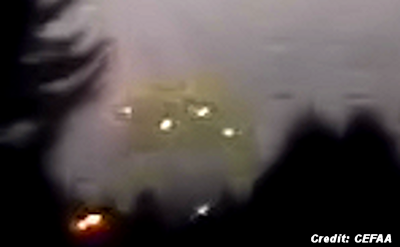 On May 21st I posted the story "Exclusive: New Video of Unexplained Aerial Phenomenon From Chile." It described a sighting of three consecutive formations made by five spinning lights: a straight line, a triangle, and a circle. Three reliable witnesses witnessed the spectacle at an Air Force Academy; two captured the triangular formation on their cell phones. The lights appeared so close that the witnesses thought whatever it was might land. A sergeant with more than 20 years experience in the Air Force also described seeing a submarine shaped "ship" with lighted windows. The case was thoroughly investigated by the official UFO agency in Chile (CEFAA), along with its volunteer committee of scientists, Air Force technicians, police, psychologists and other specialists. They ruled out every conceivable explanation. Since the "submarine UFO" seen by the sergeant was not observed by the other two witnesses, the committee from Chile formally concluded that the case involved an "anomalous light phenomenon" and left it at that. Therefore, in my blog post yesterday, I felt it was my responsibility to write conservatively and honor this conclusion. . . .